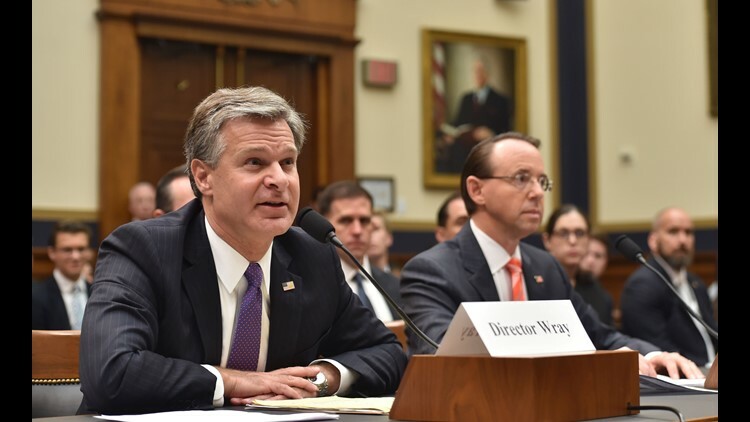 FBI Director Christopher Wray, left, and Deputy Attorney General Rod Rosenstein testify before a congressional House Judiciary Committee hearing on "Oversight of FBI and DOJ Actions Surrounding the 2016 Election," in Washington, DC, on June 28 2018. Hey, OP fam. It's been a long day (week/month). We're thinking of the journalists at the Capital Gazette in Annapolis, Maryland, where a gunman opened fire and killed five people. Just remember: At the end of the day, we're all human. Republican lawmakers and Deputy Attorney General Rod Rosenstein clashed Thursday as part of a bitter dispute over the Justice Department's handling of the Clinton email investigation and the inquiry into the Trump campaign. Rosenstein and FBI Director Christopher Wray were called to testify before the House Judiciary Committee, where things got heated. "We caught you hiding information!" Rep. Jim Jordan, R-Ohio, said. Rosenstein wagged a finger at the congressman, calling his remarks "deeply wrong." "It's not accurate, sir," Rosenstein said. "I am not hiding anything from you. ... If you are interested in the truth, there are (people) working around the clock, doing their best (to provide the information requested)." Related: The House passed a resolution today that demands DOJ hand over scores of documents related to the Russia investigation. First lady Melania Trump made her second visit to the southern border region Thursday, just a week after her first visit was overshadowed by her wardrobe. (We still don't really care about Melania's jacket, for what it's worth. There are bigger fish to fry.) On Trip 2 to Arizona, Mrs. Trump aimed to display a more compassionate view toward separated immigrant families while her husband, the president, pushes his crackdown on illegal immigration. In Tucson, Arizona, Mrs. Trump visited a Customs and Border Patrol facility to learn firsthand how those on the front lines – meaning Border Patrol officers, immigration agents, immigrant families, social workers and residents – deal with immigrant children. The first lady also stopped in Phoenix, where she met with people who work with the Office of Refugee Resettlement and Southwest Key Programs, the nonprofit that has housed the separated children. Donald Trump's tariffs: When the impact hits shelves at Walmart, how will voters react?